Rather than buy a new PC today that may become obsolete or underpowered for your needs in a few years, Paperspace is an inexpensive zero-client device that gives you access to a powerful computer. Paperspace lives in the cloud instead of physically on your desk, and all you need to access this new cloud-based computer is a web browser and internet access. The idea is not dissimilar to enterprise virtualization solutions such as those offered by Citrix and VMWare, but Paperspace is targeting consumers, small businesses and enterprises. Where Paperpace shines is its simplicity. 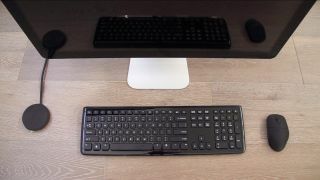 The solution doesn't require much technical knowledge, and consumers can plug a small Paperweight receiver with a microprocessor to a display, attach a keyboard and mouse, and connect to their Paperspace PC over the internet. If you haven't invested in a powerful workstation yet, you can buy a Paperweight, which is a puck-sized receiver. Your Paperweight will connect you to the Paperspace cloud PC. All you need to do now is attach your keyboard, mouse and display. If you have an existing computer, all you really need to access your new cloud-based Windows or Linux PC on Paperspace's servers is a web browser. The Paperspace cloud computer is like a regular computer. You can access all your files, documents and applications from any internet-connected terminal. When you travel, your whole Paperspace PC comes with you, so you don't need to manage files or make sure that your work laptop has the proper apps and licenses installed for the programs you need that are on your desktop. For consumers and small businesses, the idea of Paperspace is similar to Chrome OS. While Google allows users to run Chrome apps from either the Chrome browser on an existing system, or from a Chromebook or Chromebox, Paperspace lets you run your favorite Windows or Linux programs from a browser or from Paperweight. The difference is that Paperspace gives you access to powerful programs for 3D rendering and photo editing, the full power of Windows and Linux, and powerful processing and graphics power. As everything lives in the cloud, Paperspace makes sharing and collaborating easier. Sharing is instantaneous since all your files are already in the cloud, so you won't need to worry about uploading. Paperspace runs Windows or Linux so you can install all your favorite programs. You can install processor- and graphics-taxing programs like 3D CAD, simulations and photo and video editing software. For enterprise users, Paperspace promises predictable costs, access to shared drives, security features and encryption, and 24/7 monitoring in case things break down. There is even a control panel for administrators to easily manage multiple systems. If you work in multiple offices, Paperspace could eliminate the need to carry around a heavy laptop. You can log into your Paperspace PC from any office terminal and have access to your same desktop, files and documents. You won't have to worry about transferring files, copying presentations to flash drives to take with you, or synchronizing the latest version of your sales proposals. Right now Paperweight, the hardware puck that gives you access to Paperspace, is available for pre-order for $50 (£35, AU$65). Paperspace's cloud-based PC access starts at $10 (£7, AU$15) per month, with different tiers based on the performance you need. Users can choose from a Windows 7, Windows 8 or Ubuntu configuration, and Paperspace intends on offering other OSes in the future, including Mac OS X. You can visit the Paperspace site for more information on Paperweight.